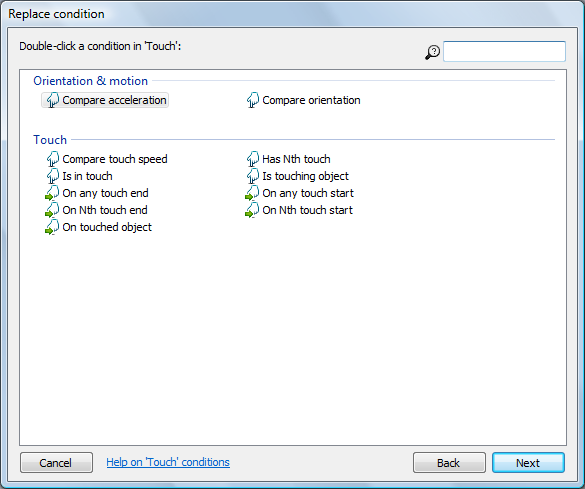 How do I access Touch conditions? I wanted to add touch controls instead of mouse clicks, but the "On double tap, On tap, and On Hold" conditions are not showing. Is there any particular reason why? Hello, i'm very excited to be part of this wonderful community. Sorry for my bad english. Disclaimer: I tried using the search for this dumb, basic question, but i found nothing, thus why i'm making a thread. I recently acquired construct 2 and am fiddling with it to make a small test game. I've made two layouts, one is called Title and the other Game. I tested Game first, added a timer so that when it went to 0, it would automatically use "go to layout" to Title. This works fine. However, from Title, i cannot go to Game. I made a button in Title called BotonInicio that, when pressed, it should change the layout to Game, but no matter what i do, it won't work. The button works in the sense that once i'm testing the game, hovering over it and pressing it shows the button working, but it simply won't change layouts. I wonder if there is a step that i'm missing. 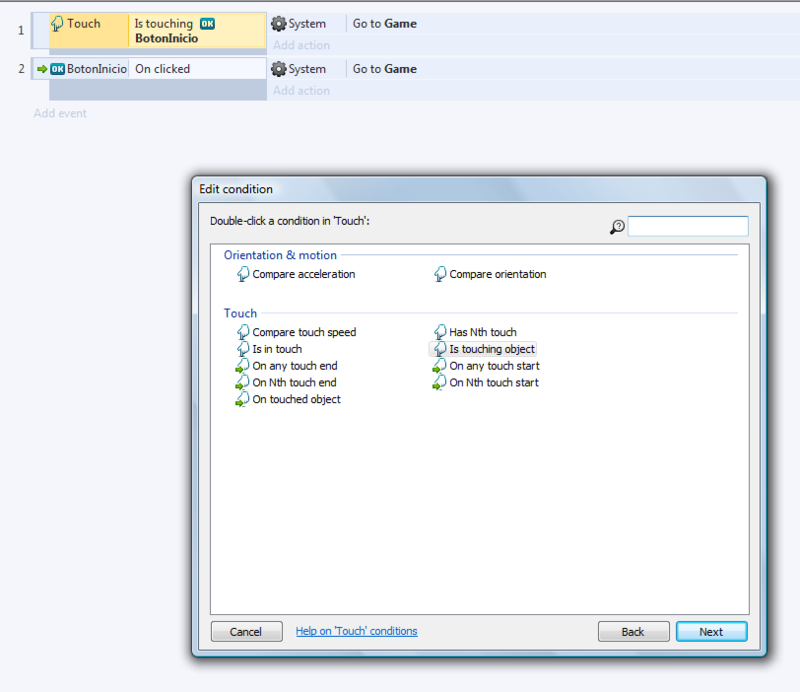 The button is visible and enabled. 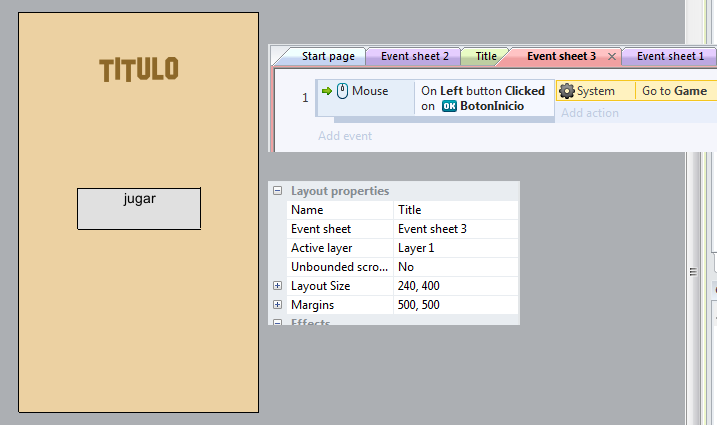 The event sheet is allocated to the proper layout, everything should be in order, but the button won't work. It's weird because in the Game layout i made another button that when pressed it adds 1 to score, and it works. I then made an extra layout called Game Over with another button that, when pressed, should send you to the title screen, but that button doesn't work either. Buttons are not working. EDIT: I solved it, turns out i also need to add an action for the button's clicked status. How dumb. The double tab conditions should be shown. Coud you show your event sheet? Start new blank event and avoid put them in sub event. Here is the event sheet. As you can see the touch event is placed as a blank event, not a sub event, so i really don't know why it isn't displaying the tap conditions. That is strange.. does it matter if you change the button with a sprite? Nope, i just tried looking for them in other settings but i can't find them. I guess i won't be making touch games anytime soon then.